Khanqah is any place designed for Sufi gathering. It is specific for the spiritual purification and training of disciples and seekers of Allah. ‘Khanqah’ originates from the Arabic word ‘Khanegah’ which refers to residence. It is, in fact, residence for Dervishes where they adopt seclusion from world to engross in dhikr and meditation. Here, perfect spiritual guide (Murshid Kamil) bestows inward purgation upon his disciples by virtue of his spiritually powerful attention. Moreover, he trains them for preaching. The Shaikh/Murshid may also reside in Khanqah. Sultan-ul-Faqr VI Sultan Mohammad Asghar Ali defines Khanqah as any place where the spiritual guide stays for the purpose of spiritual purification of disciples as well as for preaching. The spiritual leader of Suhrawardi order Shaikh Shahab al-Din Suhrawardi RA writes in his book Awarif ul-Ma’arif, that in this verse ‘houses’ refer to the places where people of dhikr gather i.e. Khanqahs. It does not refer to ‘Mosques’ because Mosques are not like houses. That is to say, they do not provide permanent residence. The most prominent feature of a Khanqah is that it is devoted solely for the cause of Allah. Nothing related to worldliness has any room here. Its dwellers keep glorifying the name of Allah perpetually. Moreover, they practise best morals and follow footsteps of Holy Prophet sall Allahu alayhi wa’alihi wasallam. Hence, set examples of good human beings to attract others towards mysticism and Faqr, the path to Allah. Furthermore, obligatory prayers, all forms of devotion as well as preaching are a part of their daily routine. Thus, Khanqahs are a major part of Sufi institution. All the Saints in past as well as present have been establishing Khanqah for the said purposes. Sultan-ul-Ashiqeen Sultan Mohammad Najib-ur-Rehman is the present spiritual leader and Murshid Kamil Akmal of Sarwari Qadri order. Following the pattern of earlier Saints, he has established Khanqah which is house for seekers of Allah since October 2009. It not only provides them seclusion for dhikr and meditation in order to build stronger relation with Allah but is also a center of all activities of Tehreek Dawat-e-Faqr. It is the movement initiated by Sultan-ul-Ashiqeen for spreading Faqr-the true soul of Islam. Khanqah of Sultan-ul-Ashiqeen Sultan Mohammad Najib-ur-Rehman is located at 4-5/A, Ext. 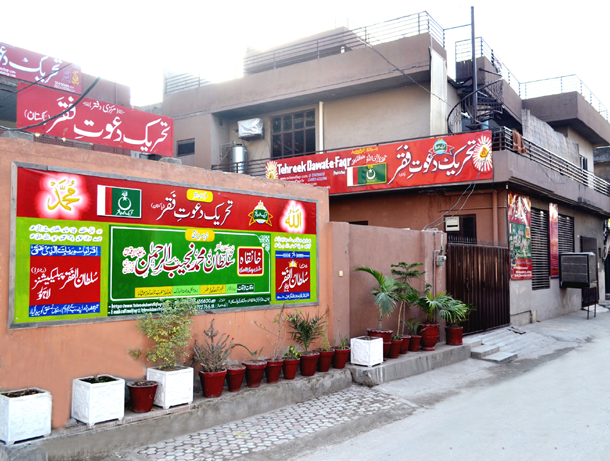 Education Town, Wahdat Road, Lahore, Pakistan. Its doors are open day and night for everyone without any discrimination of sect, caste, creed or status. However, this place has become insufficient to accommodate rapidly growing number of devotees towards perfect spiritual guide for inner peace. Hence, the heir of Faqr Sultan-ul-Ashiqeen intends to establish a vast Khanqah and Mosque for seekers of Allah. Mainly, its purpose is to provide spiritual retreat and character reformation to those who wish to enlighten themselves with Faqr. Here, all devotees would be welcome to mediate, practise invocation and contemplation of Ism-e-Allah Zaat, the personal name of Allah. Hence, attain spiritual purification from the perfect spiritual guide and elevate to closeness of Allah. Donate generously for the purpose of construction of this Khanqah and Mosque. No doubt, these donations will shower countless blessings and will be fruitful on the Day of Judgement.